Your guide will pick you up in an SUV from the Mercer Island Park and Ride, which is easy to get to by public transportation from most places in Seattle. You will arrive at the trail head, after possibly stopping along the way to take in a beautiful view of Bellevue, Lake Washington, Seattle and the Olympic Mountains (depending on weather). Once at the trailhead, you'll receive a brief orientation before beginning your amazing journey into the woods to learn about forest treasures and the historic hidden past of this area that once was home to three bustling coal mining towns. About halfway through the hike you'll stop for a "Forest Bath," a Northwest snack and water along beautiful Coal Creek, then finish your hike before heading back to the Park and Ride. Duration is 2.5 to 3 hours, depending upon hiking speed. Join me for a personal journey along a trail that's loved by locals, but little known by tourists. We'll walk the gently rolling 4.25 mile trail along a beautiful wooded creek bordered by thick native foliage to learn about the area's coal mining history and see remnants of the past hidden from those unaware of the fascinating stories that haunt this urban out post. 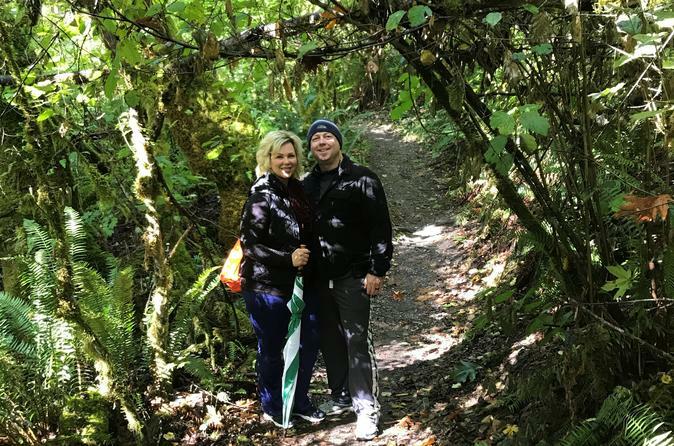 You'll enter a temperate rain forest, where you'll find plants growing on other plants, mosses, ferns and lichens that festoon tree trunks and branches, giving the forest a "jungle-like" feel. We'll learn about the large old trees that call this place home and find out which plants you can eat, those you should avoid, and which hold medicinal powers. Right now the thimble berries are ripening. Enjoy this rare delicacy before the bears eat them all! See where President Rutherford Hayes visited, discover a hidden mine shaft and stumble upon relics of a once-bustling town that's being reclaimed by Mother Nature. You won't forget this true Northwest experience - perfect for all ages.